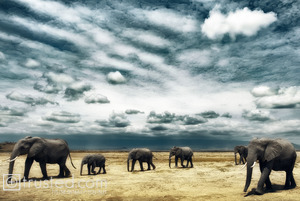 A herd of Loxodonta africana (African elephants) crossing the vast grasslands of Masai Amboseli National Park, Kenya. “This particular picture was taken in the Masai Amboseli National Park, in Kenya. Mt. Kilimanjaro is in the distance. Dereck and I started to follow some herds in search of water. I was on a hill, lying quite low on the ground, with a very wide-angle lens. As the elephants approached, I took the photograph.